It was time. I hated the crib. In Montessori Infant Communities/Nido’s babies sleep on firm mattresses on the floor. We live where it’s damp most of the year. With the dampness comes mold. Everywhere. Our beds have to be elevated to allow for airflow. So we had a crib, and I waited for the day he could independently climb into his bed. The day is finally here. His low shelf continues to hold some creative materials. A wooden drum, small basket of wooden blocks and a basket of trains. 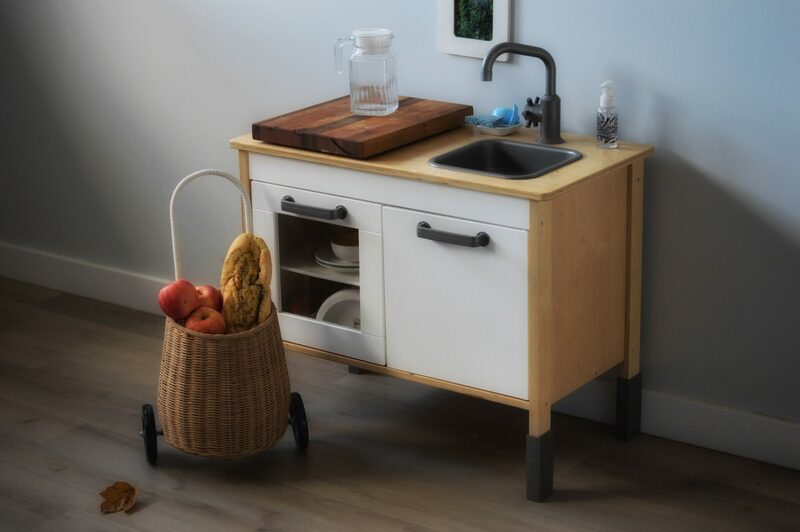 Everything else with the exception of the Practical Llife kitchen items and his Care of Self area in the bathroom is downstairs in the boys work area. The table and chair in Quentin’s dressing/Care of Self area were made by my Great Grandfather. I’m so pleased that they are a part of Quentin’s room. This is where we help him dress in the morning, and comb his hair. He loves looking in the mirror when he’s combing/I’m combing his hair. His little book bag was a custom made 1st Birthday gift. Quentin’s closet: from my perspective and his. The blue striped storage bins on the top shelf are where we keep the materials that are out of rotation, and some of his preemie clothes which I can’t bare to part with even though they make me sad sometimes. The clothes rail holds his special occasion clothes. The rest of his clothes (and there aren’t many) are stored in the easy to pull bins or on the shelves of the shelving unit. 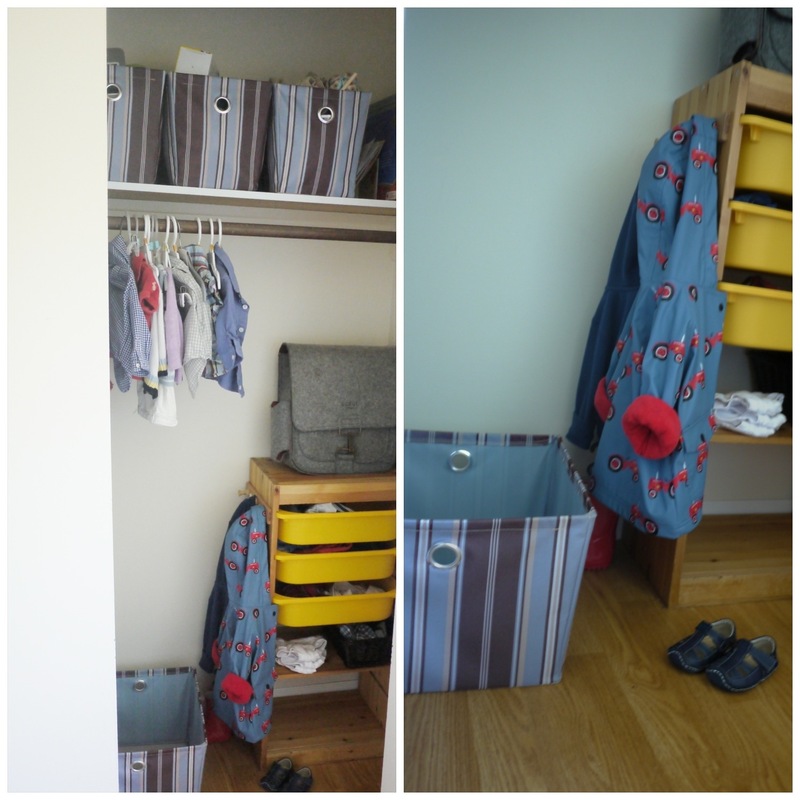 The bins are for the larger items (pants, shirts & pj’s), the shelves hold his underwear and his sock basket. Everything is at Quentin’s level so he can independently access his clothes, but the bins also provide me the opportunity to quickly clean up his closet without having to stop and hang everything on hangers. The large blue striped bin on the floor holds his dirty laundry. 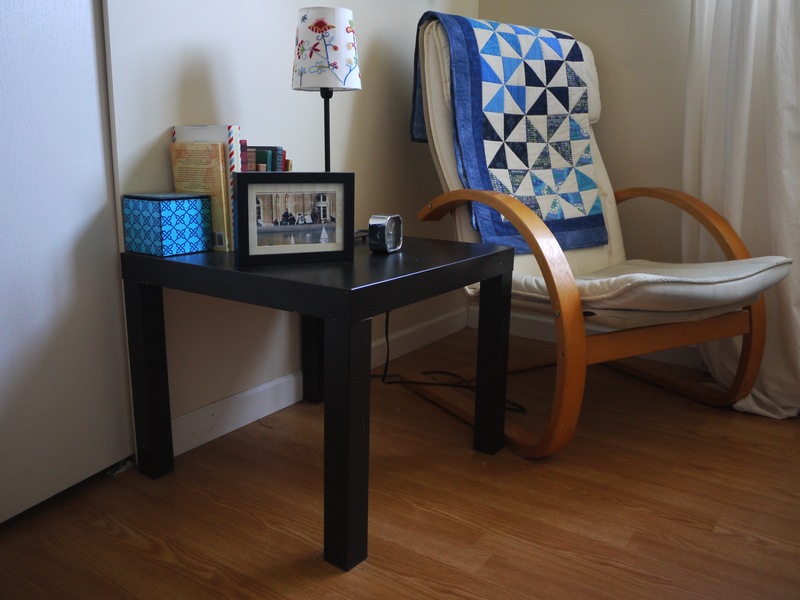 Lastly, there is the nursing/snuggling chair in the corner. The quilt on the back of the chair was presented to us in the hospital. The local quilting group presents every premature baby in the Neonatal Intensive Care Unit with a handmade quilt. I chose it before I even got to see him (other than the brief seconds after delivery before they rushed him away). It came home before him and has seemed to always be here. The books on the table are antiques of favourite stories, and some of my Montessori books. Breast feeding a preemie is difficult to say the least. It was a ridiculous ordeal, but I stuck it out and he naturally weaned himself around his 1st Birthday. This spot remains one of our most favourite in the house. We still read stories before bed here, but it holds much more than that. For me it’s the hard work and effort and love of my child all wrapped into a cosy corner. That’s his bedroom or most of it. I will have to photograph the artwork in another post. I’m happy with it for the most part. It’s simple, beautiful and filled with natural light. It will work well, and is easily changeable to suit Quentin’s changing needs. Hi! 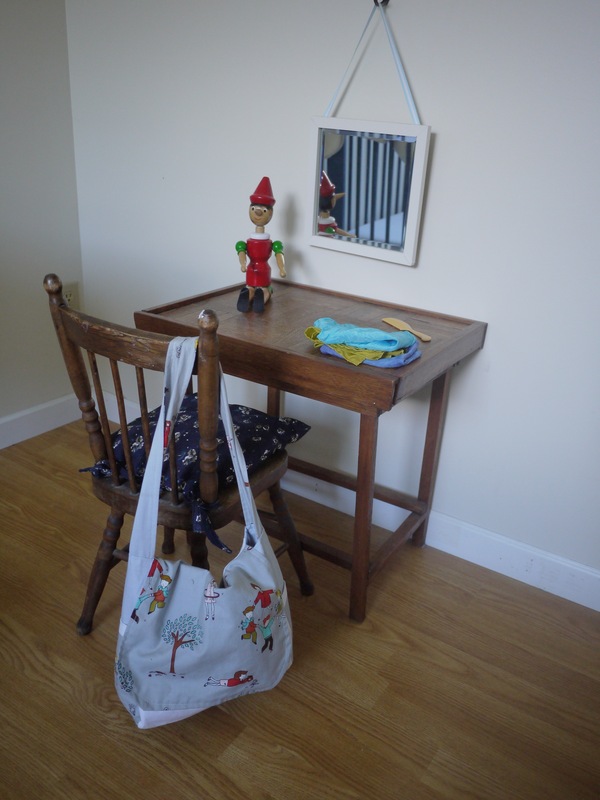 Thank you so much for sharing your son’s beautiful Montessori room! 🙂 We are facing the same situation, deciding to do a crib rather than a floor bed because of damp climate (and also because of a recent, minor head injury our daughter sustained, the floor bed makes me nervous until she can climb/crawl more easily). On that note, how did you know when your son was ready to transition to the toddler bed? What signs did you watch for in terms of climbing? Did you wait until he was walking, or after? Thanks again for sharing the room set-up – we hope our daughter’s will look as lovely and simple as that! Our son was born prematurely and therefore small for his age. As well as this, he walked later than the norm. We waited until 13 months to take off the side of his crib turning it into a toddler bed. We waited until he could stand well, and climb the small height off the floor confidently. He was also well into pre-walking. Now he has just turned 3 and we have only just transitioned him to a regular single sized bed. The toddler bed lasted him 2 years, and could have lasted longer size wise but we thought a “big boy” bed would be a nice 3rd birthday present. 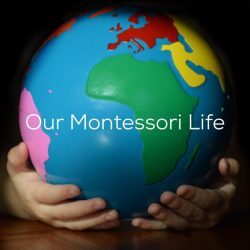 Thank you for the post, definietly helpful to see a detailed example of a Montessori bedroom for a newbie like me. We have a 20 month old in his own room and a 1 month old who is in a bassinet in our room. 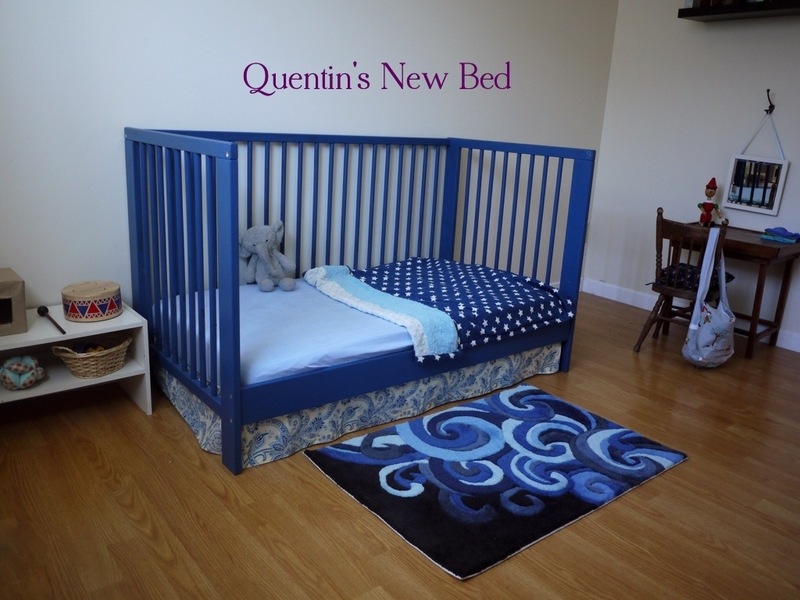 I would love to try the floor bed with our new baby ( i only heard about Montessori after our older son was very much a toddler so we didn’t use a floor bed) …is it possible to have the two share a room if they are both able to get out of their beds? My worry is my older son would poke and prod the infant if he has access to him. Any advice on bedroom sharing with the Montessori approach would be much appreciated. Thanks! It is not safe to keep an infant in a room with a toddler unless there is supervision from an adult. Therefore it isn’t recommended to have them on floor beds together. Instead you would need a crib for the infant.